AIEA recognizes contributions to the field of international education leadership through four awards presented at the Annual Conference each year: the Charles Klasek Award, the Harold Josephson Award for Professional Promise in International Education, the Timothy J. Rutenber Award, and the Innovation Award in Internationalization. The Call for Award Nominations goes out to AIEA members in May, with a deadline of October 1 for all nominations. Nomination forms are available online: The Charles Klasek Award, The Harold Josephson Award, The Timothy. J. Rutenber Award, and The Innovation Award in Internationalization. Each year AIEA presents the Charles Klasek Award at the Annual Conference. "Chuck" Klasek was a founding member of AIEA from Southern Illinois University at Carbondale and served as its third president. In addition to being a real leader in the founding of AIEA, Chuck was an excellent example of an effective international education administrator. He took on many tasks within AIEA including, in 1992, the editing and publication of Bridges to the Future: Strategies for Internationalizing Higher Education. When Chuck died, the Executive Committee felt that a fitting tribute to his outstanding service to AIEA and to the field of International Education Administration would be to present an annual award in his name. The single criterion for the award is that the recipient should have given long-term and outstanding service to the field of International Education. 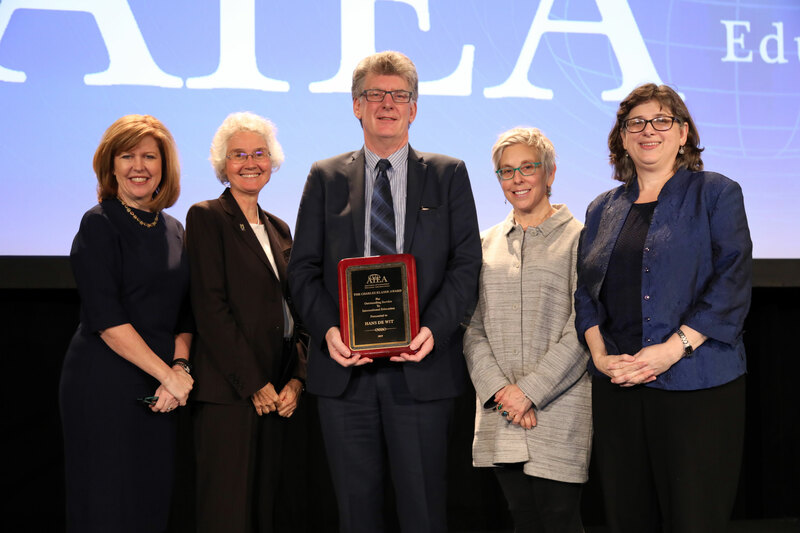 Pictured (L-R): AIEA President Cheryl Matherly, Immediate Past President Nell Pynes, 2019 Klasek Award Recipient Hans de Wit, Past President Hilary Kahn, and AIEA Executive Director, Darla Deardorff. 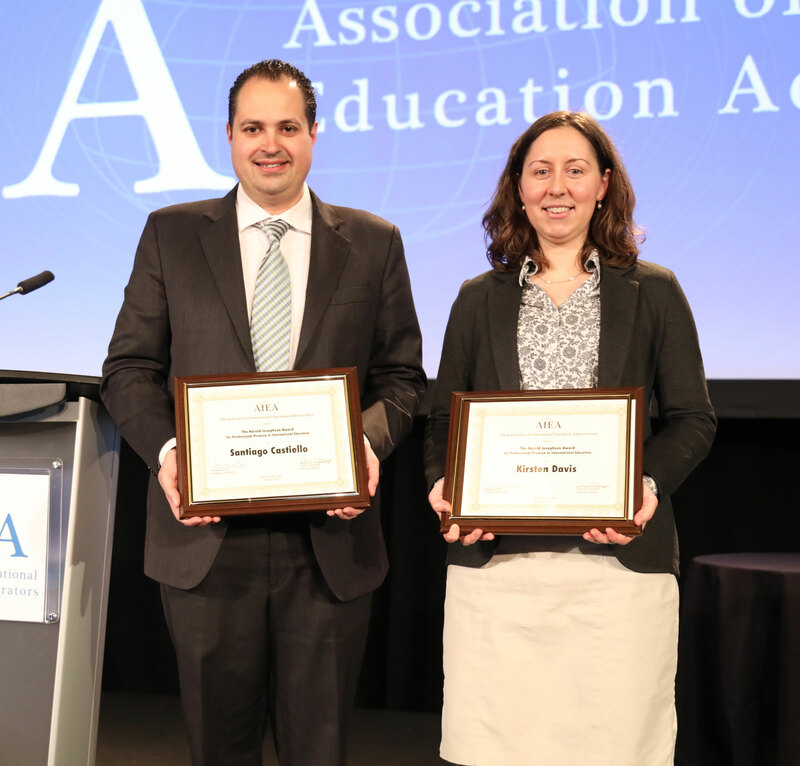 Each year, AIEA presents Harold Josephson Awards to deserving graduate students who are making a significant contribution to the field of international education. The awardee may be at the masters or doctoral level, in any disciplinary area. The award recognizes emerging leadership in international education, as evidenced by the students' graduate study, involvement in international education initiatives, research related to international education, and/or other relevant contributions. This award was established to honor the memory of Dr. Josephson, a long-time leader in AIEA and Assoc. Vice Chancellor of International Programs at the University of North Carolina-Charlotte, who died in 1998. The award includes a $1,000 travel grant to attend the annual conference of AIEA, complimentary conference registration, and an opportunity for the winner to report on her/his contribution to international education to the conference attendees. The recipients of the Harold Josephson Award will also be included in the conference program and recognized during the annual conference. The Timothy J. Rutenber Award is an award established to honor AIEA members who have rendered long-term and outstanding service to the Association. This occasional award is named for the late Timothy J. Rutenber, who served as Director of the Secretariat and Treasurer of AIEA until his death in 2004. An associate member of AIEA since 1992, Rutenber was an outstanding manager of the day-to-day affairs of AIEA and a wise steward of the Association's resources. His work on behalf of AIEA epitomizes the ideal of service excellence. In his name, awardees will be recognized at the Annual Conference for truly exceptional service of long duration to AIEA. To be eligible, nominees must be current AIEA members and have been actively involved in AIEA for more than five years. 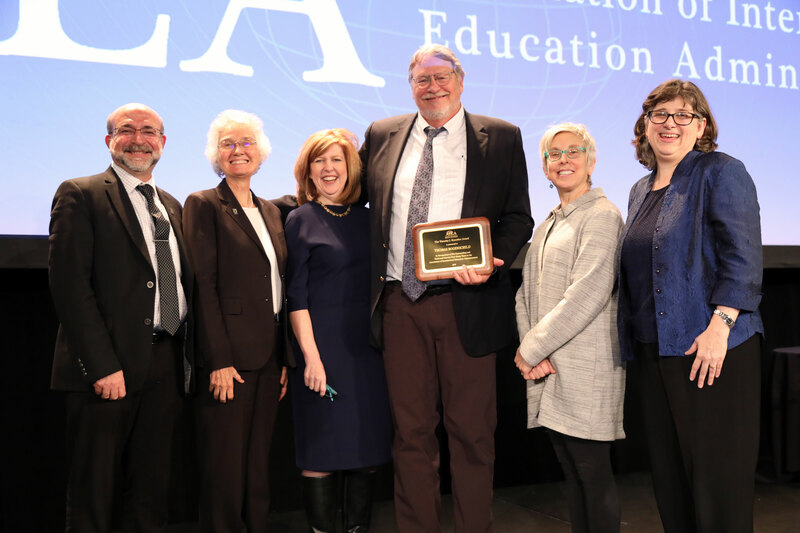 Pictured (L-R): President-Elect Adel El Zaïm, Immediate Past President Nell Pynes, AIEA President Cheryl Matherly, 2019 Rutenber Award Recipient Thomas Bogenschild, Past President Hilary Kahn, and AIEA Executive Director Darla K. Deardorff. As colleges and universities around the US come to increasingly recognize the value and importance of pursuing internationalization as a distinct and intentional project, the need grows for models regarding various aspects of this work. Many SIOs work tirelessly, with little institutional support, but with passion, vision and commitment to pursue internationalization in ways to best meet institutional needs. Some of this work is not only effective, but outstanding, and worthy of emulation by other SIOs who are either new to the field or value new approaches to the work they do. In 2015, AIEA selected the inaugural Innovation Award in Internationalization that highlights exceptional programs, projects, or initiatives aimed at advancing internationalization and directed by SIOs on their respective campuses. The categories that can be used for these programs are based on the American Council on Education’s six elements of comprehensive internationalization (Articulated Institutional Commitment; Administrative Structure and Staffing; Curriculum; Faculty Policies and Practices; Student Mobility; Collaboration and Partnerships). 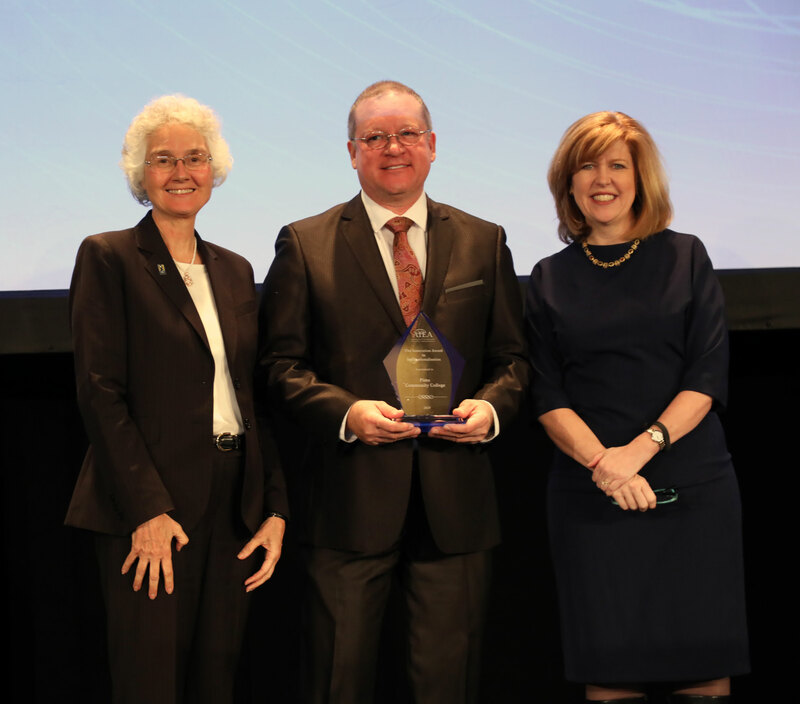 Pictured: Nell Pynes (L) and Cheryl Matherly (R) presents Pima Community College with the 2019 Innovation in Internationalization Award.